More disgusting dhimmitude in the UK. I wonder who the "anti-Zionist" (aka Anti-Semitic) groups are?? Anyone have a guess?? A London theater that hosted a Deir Yassin commemoration has bowed to pressure by anti-Zionist groups and canceled an Israel Independence Day celebration. The Bloomsbury Theater in central London was scheduled to host the UK Jewish community's annual Independence Day event organized by the Zionist Federation of the UK (ZF) on April 28. Initially, after the theater received complaints from anti-Israel groups, the ZF agreed to exclude an IDF entertainment troupe that had been scheduled to take part, but following further protests, the theater decided to cancel the event completely. A letter sent to the theater by a fringe group calling itself the International Jewish Anti-Zionist Network said: "How will you monitor that IDF performers will not appear under another guise? On a matter so serious as entertaining the presence of those accused of genocide by the UN and others respected for human rights monitoring, surely you don't intend to be satisfied that the IDF's removal from the ZF's publicity is enough." In an e-mail sent on Thursday to the protesters, the theater's director, Peter Cadley, said: "Further to my recent e-mail regarding proposed performances at the theater by an entertainment troupe associated with the Israel Defense Force, it has now been decided that, despite assurances that the troupe had been withdrawn from the line-ups, the events in question will now be canceled. Thanks again for your e-mail; I hope to welcome you to an event at the Bloomsbury Theater in the future." In April 2006, the Bloomsbury Theater hosted an event to commemorate the events of Deir Yassin. Titled "How Palestine became Israel," it was organized by a fringe group called Deir Yassin Remembered (DYR), led by Paul Eisen. On the group's board of advisers is Swedish journalist Joran Jermas, also known as Israel Shamir. Both Eisen and Shamir have been accused of Holocaust denial. The ZF called the theater's cancellation regrettable, but said that in the wake of moving the celebrations to a north London venue, it had been inundated with calls of support and requests for tickets. "It is a sad day for Britain when ill-informed minority lobbies attempt to limit freedom of expression in a family cultural program that has had a similar format for many years," ZF Chairman Andrew Balcombe said. "We are delighted that the shows are going ahead and, because of the recent publicity, we have been inundated with calls of support and ticket requests. The audience from the Jewish and general communities will be coming together to celebrate Israel's 61st birthday and see the rich cultural diversity that is Israel, the only democracy in the Middle East," he added. Bloomsbury Theater representatives were not available for comment. What do you think would happen if a boutique in Paris began selling T-shirts with "Muslims forbidden from entering the park" printed in bold letters on the shirt front? Can you imagine the outrage - angry mobs of muslims with contorted facing running into the streets while they rant and rave over the (myth of) Islamophobia. Loud demands would be issued calling for the store be closed (more likely it would be set on fire), the owner punished and likely a fatwa would be called against the shirt designer. Mobs of "North African youths" would pour into the streets and cars would be set on fire and other riot behaviors would begin. Politicians would be tripping over themselves in a rush to publicly denounce the shirts. Clearly this scenario would likely precede the burning of cars (if they can find anymore cars left to torch) and other muslim riot behaviors. The muslim pandering mainstream media and other so called "leaders" would have front page articles and public speeches all aghast at this mistreatement of poor misunderstood and abused muslims - thus certifying their dhimmitude. So why is their virtual silence from the media, politicians, and other human rights proponents? Why? Because the T-shirt described above is NOT about muslims - it is directed at Jews. A shop in the Belville area of Paris, known to be the site of ongoing fighting between groups youths of North African origin (mediaspeak for muslims) & Jews, has been selling T-shirts emblazoned in German and Polish language that translate as "Jews forbidden from entering the park". 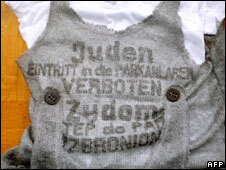 If that isn't bad enough - the shirts are replicas of Nazi signs that targeted Polish Jews back in 1940. So where is the outrage??? Why are no public figures rushing forward to get their "photo opportunity" to show their support for the Jewish people and to denounce these anti- Semitic shirts?? The "cricket chirping" silence says it all.